Why not visit my collection of banknotes -- all with the serial number 137! 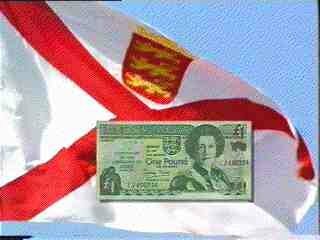 "The coin current in Jersey was, until lately, chiefly that of France, with a small proportion of Spanish money. The usual amount of specie in circulation, has been estimated at nearly £80,000 sterling. After the French revolution, the coin of England came more generally into use, until the increased value of gold and silver completely drained the island of all specie but copper, and even that became scarce. There were, at this point, three regular banking houses in the town of St. Helier. These, and a few mercantile men, were accustomed to issue notes, payable to the bearer on demand, for twenty-four livres French currency, or one pound sterling. So great, however, and so increasing were the inconveniences occasioned by the almost total disappearance of silver, that those houses were obliged to issue notes of five and ten shillings: this induced individuals to do the same; all having 'Jersey Bank' on their notes; until there were about eighty of these soi disant bankers. The island was soon inundated with notes, from the value of one pound down to that of one shilling; many of them issued by the lowest description of traders and publicans. Alarming as this undoubtedly was, necessity gave to these notes a general and ready circulation. Seriously aware of the ultimate consequences, likely to result from this unrestrained emission of paper money, the States resolved to have a silver coin struck: accordingly, a quantity of tokens was issued bearing the value of three shillings, and of eighteen pence English, ..."